On June 23rd, 2018, the Kansas-Nebraska Radio Club will be participating in the 2018 Amateur Radio Relay League Field Day. 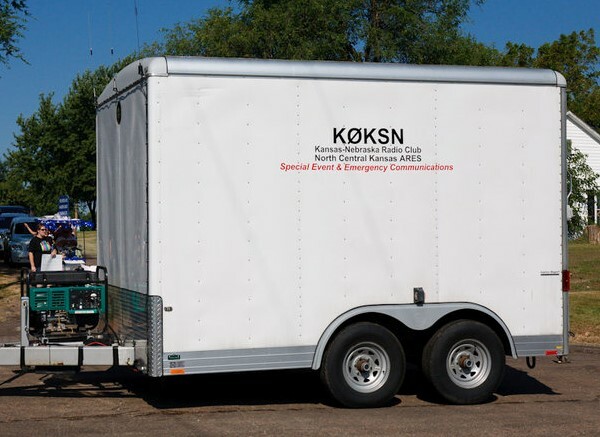 The KNRC will be set up at the Glasco VFW in Glasco, KS located just north of Spaulding Ave on Railroad Ave. We will have our Communications Trailer set up and it will be open to the public to see and ask questions. We will be setting up around 10am on the 23rd. Every June, more than 40,000 Hams throughout North America set up temporary transmitting stations in public places to demonstrate Ham Radio’s science, skill, and service to our communities and our nation. It combines public service, emergency preparedness, community outreach, and technical skills all in a single event. Field Day has been an annual event since 1933, and remains the most popular event in Ham Radio. As part of this event, the KNRC will be running on a generator and using temporary antennas. This is designed to simulate operation in an emergency and disaster situations. We will be making contacts with other Ham Radio Operators across the nation using different modes of making contact.